I always stumble upon movies midway through as I’m flipping through channels on the television. 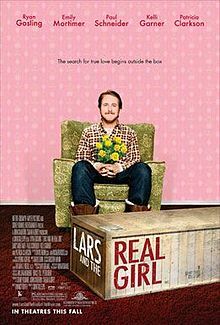 Not too long ago, I stumbled upon a movie called Lars and the Real Girl, a movie about a man who falls in love with a plastic mail-order, pump-her-with-air girl. When you start viewing a movie after it has begun and what you see is a guy talking to a plastic girl at the dinner table, you really try hard to figure out what you’ve missed. In the movie, Lars is toting around a life-size plastic, blow-up girl, as if she were a real person. He takes her to dinner, to parties, to church. Lars is delusional. Lars never got over the deaths of his parents. So, to deal with these personal losses, he creates a life with this plastic girl that makes him feel safe and secure in relationships and life, because his lifeless plastic girl doesn’t die, doesn’t cheat on him, doesn’t otherwise leave or hurt him like a living, breathing person could. Lars begins seeing a psychologist, under the guise that he is helping his plastic girlfriend get well. At some point Lars begins to heal from his personal losses, let’s his plastic girlfriend go (he allows his mind to let her die), and begins life anew with a real girl from the office. After pondering just how messed up this movie was on so many levels, I turned my mind to real people; how, like Lars, we sometimes either conjure up stuff in our minds for whatever reason – to protect ourselves, save face or simply make ourselves feel better. Or, we may be like Lars’ plastic mail-order girlfriend, who simply exists and allows life and people to do unto her, without any say-so into the decision-making process about her life. We can see from this movie, and maybe ourselves and others we know, that we can be alive and still be dead and wounded inside as Lars was. But also like Lars, we can begin to live when we are willing and able to let go of the past and open ourselves to change and what the present moment offers us. Lars was stuck between life and spiritual death, which I’ll call the “living dead”. We become like the living dead when we refuse or are too afraid to make a choice to live our lives to the fullest and let go of the things in our past that cause us misery and keep us stuck. When we don’t make that choice, we are stuck between the two, and it’s like our life is suspended. We feel life is passing us by – and it is. And the way out is not by purchasing a life-size plastic mail-order girl or guy or camouflaging our pain and failures. The answer lies in facing the truth, making a move/change, tapping into and embracing the God of our salvation and the many blessings He’s already placed in our lives. We don’t need dead things like plastic dummies and dolls from whom not a single idea can flow. Nor do we need anyone or anything that stifles our creativity, our joy, hope and our peace. Let’s not be like Lars and resort to trusting in inanimate objects and unprofitable people, thought patterns and options that aren’t helping us to move forward and to be our best. Let’s free ourselves and begin anew with a renewed mind and commitment, not only to God, but to ourselves. Don’t think for a second that God wants us to be like the living dead, walking aimlessly – without purpose, vision or hope, lost in this world. This is not the will of God. For this reason Christ died for us all. Let’s not waste the opportunity to be our best and live our best life NOW.